The British pound is trading higher on the day versus the greenback. 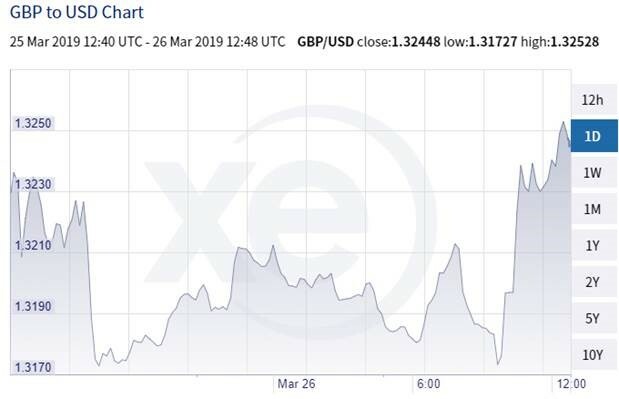 However, the currency remains volatile with the ongoing Brexit saga. The House of Commons saw another defeat for Theresa May, and the MPs will be voting on several amendments hoping to find a real exit plan. The coming days could be crucial for the PM, the GBP and the business community. The US dollar is trading higher against most of its major peers amidst easing market worries about yield curve and recession. The DXY gauge is at 96.50, steady around the seven-day high. Stock markets are bouncing back in the green today: Nikkei advanced 2.15%, European stocks are blowing hot and cold and US futures signalling a positive open. The currency market is expected to trade with a mild tone with a focus on US housing starts and more speeches from the members of the Federal Reserve. Brexit drama is expected to send more shockwaves across the market, as MPs voted to take control and will be holding indicative votes on an “improved” exit plan. Prime Minister Theresa May could be walking on thin ice after she admitted she did not have “sufficient support” to bring her Withdrawal Plan for a third vote. The MPs voted 329 to 302 to take control of the Parliamentary schedule today and will be holding several indicative votes on the next steps. The UK technically has until April 12th to leave the EU with no deal or “indicate a way forward” to the EC. If the House approves the Withdrawal deal, the departure date will then be on May 22nd. As we approach the last minute, we are likely to see the emergence of an agreement through the market remains uncertain on its shape and form. EUR/USD remains inside a tight trading range for the second consecutive session. Better-than-expected German GfK data extended little support to the common currency. The mood seems to be improving somewhat, and fewer expect an economic collapse. Uncertainty over Brexit and trade tension between the EU and the US are weighing on sentiment and business decisions. The 1.13 level remains critical for the euro as investors adopt a cautious approach ahead of Brexit developments. The Canadian dollar is trading with a firmer tone against the greenback this morning after the WTI gapped higher and approaching the significant $60 a barrel mark. The economic calendar remains light ahead of GDP data releases this Friday, and the US dollar-Canadian dollar pair is expected to move in tandem with oil prices. Commodity-linked currencies including the NZD have pushed higher against the majors with the British pound the worst performing of the G10 currencies on Brexit concerns. The AUD USD pair sits at 0.71308, down slightly of a high of 0.71328. The USD bounced higher against the Yen, now reaching the mid-point of 110. Yields are up, and investor sentiment has swung to Risk On with Nikkei up 2.15%. Earlier today, the core CPI reading released from the Bank of Japan showed inflation moving south to 0.4%. The central bank is expected to maintain its current monetary easing policy. The focus will also be on the regional impact of Chinese measures to kick-start the stalling economy.